Ongoing problems with remote participation at IGF 2017 have made me realize that the only way to properly participate (or even observe) in IGF is to be there in person. This was only my second meeting to follow remotely. The first was back in 2011, and I don’t remember having any problems. Remote participation wasn’t as advanced back then, and I think remote participation consisted entirely of watching a webcast. No Cisco WebEx or Adobe Connect-type functionality available. An impressive set of remote participation options! ICANN actually does remote participation very well (and goes above and beyond in the language department, adding Portuguese to their interpretation sessions). So why did remote participation at IGF 2017 not quite make the grade? The IGF Secretariat is stuck in a difficult place. The community is highly aspirational in its goals (a good thing) but collectively is unwilling to pay for it (not so good). In attempting to deliver what the community wants, the Secretariat is over-reaching itself. Instead of doing one or two things really well, it’s doing a not-so-great job on lots of things. Let me make it very clear here: I don’t blame the Secretariat for this. They are doing their best. They are hesitant to say “no” to the community they serve. The MAG is also reluctant to say “no”. Saying “no”, I suspect, is seen as antithetical to the bottom-up multistakeholder model of Internet governance. If the multistakeholder community wants something, then the feeling is it should be provided. Quality of provision, though, suffers. Instead of being able to deliver all those pimped up Porsches, all IGF can do is deliver the requested number of vehicles, but of a far inferior make and quality. Based on my experiences at this IGF, I would not recommend anyone consider participating remotely in future IGFs. Not unless things are significantly overhauled. I would, instead, tell people that they have to be there in person to have any chance of being able to follow any of the sessions. Such a recommendation, of course, rules out the participation of vast swathes of potential participants who come from developing countries or represent entities that don’t have the resources to send their representative to a far-flung location for a week’s meeting. The only real solution is to fix the remote participation. One way forward is to direct more funds to support more robust remote participation mechanisms. But given the IGF’s ongoing financial woes, I can’t see this happening in time for next year. But there is another option: rationalize the confusing array of remote participation options available. Streaming Webcast via IGF website, which pulls in the YouTube videos, and adds the appropriate live caption underneath it. Stand alone live caption pages. At various points in the meeting, there have been 11 publicly recorded/streamed sessions running in parallel. This means that at any one point in the day there were up to 4 x 11 remote participation facilities that were supposed to be active. More, if you take into account the plenary room had audio in 6 UN languages, plus the floor audio. So in total, that’s up to 50 (fifty!) remote participation streams available in parallel. It’s no wonder there were glitches. In fact, it’s a miracle it worked at all. It’s vital for IGF to have its remote participation mechanisms working well, as for many potential stakeholders, it’s a low cost entry into IGF – a way to evaluate if it’s something they want to participate in more substantially in future years, either by participating actively in the annual forum (remotely or onsite) or via IGF’s intersessional work programmes. 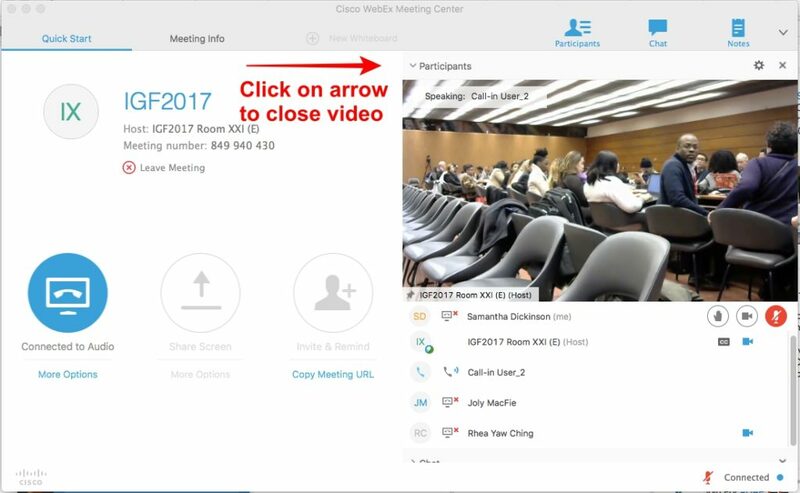 It’s also a useful tool for onsite participants, who can use the WebEx tool in particular, to interact with other participants online. Remote participation can work really well, as ICANN’s remote participation mechanisms demonstrate. Please, let’s fix this for IGF. If it means temporarily having to reduce the number of remote participation options, so remaining ones work well, and encourage people to use it as a viable alternative to traveling to IGF in person, then surely it’s worth it. IGF can always add more mechanisms back into the mix when it has the resources to fully support them. I plan to submit a version of this list below to the 2018 MAG’s call for submissions to review and evaluate IGF 2017 since my aim isn’t just to have a whinge on my blog, but to actually help fix IGF’s remote participation for future users. WebEx audio was often not turned on at the start of the day, meaning that the stenographers, who appear to take their audio feed from the WebEx, rather than webcast stream, aren’t able to transcript significant chunks of those sessions. I doubt that IGF has the funds to pay the stenographers to do additional work to go back over the webcast archives and fill in the blanks. So a lot of the archived transcripts will be missing chunks. The audio in the WebEx audio seems to be connected via a phone line, and the quality isn’t great. Because many participants at an IGF meeting aren’t used to regularly speaking into microphones, their voices are already quiet when listening through the direct audio feed from the microphones that accompanies the streaming webcast. This is made worse when the audio feed from rooms is then channeled into a phone line (or maybe even just a room microphone attached to the computer hosting the WebEx room?). The lower quality audio in the WebEx rooms makes it very difficult to what many speakers are saying. Since the stenographers are listening to the same muffled WebEx feed, you can’t rely on their transcripts to make sense of what is happening, either. The video in WebEx rooms comes from small, slightly moveable webcams. In some rooms, this webcam has been pointed at the audience the whole time. Given the setup of the desks in many of the Palais des Nations rooms, this means I’ve spent a lot of time looking at the backs of chairs and the backs of people’s heads. When I asked if I could see the speakers and presentations, I was told I would need to go look at the separate streaming webcast. Even when the webcam has been pointed at speakers, it’s generally been at desk level, and provided odd up-nose shots of speakers (and their water bottles). Why not just import the streaming webcast instead of having the inferior webcam video? Or is it technically not possible? With stenographers struggling with the muffled WebEx audio and the range of unfamiliar accents, being able to see any presentation slides from the session would be a great help in being able to understand exactly what is happening in a session. This could be achieved by uploading presentations to the computer hosting the onsite WebEx for that room, and loading it into the WebEx app, but this doesn’t seem to have been done – at least not in any of the sessions I tried watching. High quality audio and video. Great! But… it seems the timing for each webcast session link was programmed in advance and many errors were made, making it impossible to watch the session I wanted because the room link would tell me it wasn’t going to start for another [x] hours. Other times, choosing the streaming webcast link (not the direct YouTube version) would embed the end of the last programmed session in that room, which would show the beginning of the session I wanted, then 10 or so minutes into that session, the end of that programme for the previous session webcast would end, and the webcast would stop entirely, resulting in needing to refresh the page to get the next programmed webcast link…. And in the process, losing the entire set of transcript material under that. Given the transcript and WebEx links didn’t change for each session, but stayed constant for each room, it would be easy to solve all these programmed start/end time glitches by just having a single daily live feed for each room in use, then chop up the video into session length pieces later. Yes, that would be annoying for someone to have to sit through and find the start and end times of sessions that never start or end on time, but better to annoy one staff member than to alienate a bunch of remote participants that IGF insists it wants to be inclusive of. At various points in the meeting, there have been 11 sets of transcripts running in parallel. Not all 11 stenographers are equally proficient, and if you were in a session with one of the less proficient stenographers, the transcript could be… not particularly helpful. Some of the stenographers didn’t seem to even attempt any words that seem technical or specific, leaving bland transcripts that a) don’t convey the substantive discussion, and b) lack so many words – including verbs – they fail to make sense. This could be addressed to a large extent by providing the stenographers with a list of terminology and names likely to be used at the meeting and in particular sessions. But that would require work by the Secretariat (who don’t have the time) and by session organizers (the vast majority of whom have probably never worked with stenographers before, and don’t understand what their needs are). It could also be helped by having session moderators who insist that a) each speaker give their name and organization before speaking, b) tell speakers to speak closer into their microphones and c) tell fast speakers to slow down, especially when referring to technical or other specific terms that may not only be new terms for stenographers, but also other IGF participants in the session. I assume that the stenographers from the USA and have limited exposure to the huge range of accents available in the world. This makes it a challenge for the stenographers to easily understand speakers from pretty much anywhere outside North America, the UK, and Australia and New Zealand, resulting in lots of “(?”) and “(inaudible)” comments being injected into the transcripts. I recognize this isn’t an easy problem to fix, but it might be worth adding “has experience of transcribing speech in accents other than North American, British and Australia/NZ.” ICANN and ITU also have this issue with their stenographers, so it’s not a problem limited to IGF. But if IGF is to truly support and encourage diversity of input, it’s really not acceptable to have speakers from Asia, Africa and swathes of Europe constantly having their interventions at IGF (and ICANN and ITU) almost made invisible by huge holes in the transcription of their speech. This isn’t a particular fault of this particular meeting, but a general bugbear of mine. The live caption module allows for a “transcript” button that, if clicked on, pops up a new window containing the entire transcript for the current session (not just from when you entered the transcript page). I assume that IGF doesn’t have this enabled because it’s an extra cost to allow this facility. But given how long it takes to navigate to the next session you’re after (remember physical room number, then go find the transcript URL, which is numbered differently), having the ability to see what you missed would be useful. Remote participants shouldn’t have to navigate multiple pages to find the remote participation links for the session they are after. There must be a simpler way to link remote participation options from the session pages in the IGF schedule (which currently uses Sched). ICANN has managed it with Sched, so maybe they can help IGF with this. Ideally, there should be links to all the remote participation modes on each IGF 2017 session page, as ICANN meetings have, but there aren’t. You’d think that 12 years into IGF’s existence, we’d have remote participation well and truly sorted by now. But it’s not. Don’t blame the Secretariat for this. They’re doing the best they can with limited resources and an overly large “to-do” list. The remote participation difficulties are a good example of how IGF suffers because it doesn’t have enough resources to do everything that’s asked of it as well as we would all like. For those of you who are still trying to figure out how to participate remotely, or for those onsite who want some sense of how complicated it is to participate remotely, here’s a guide on how to conquer the IGF 2017 remote participation challenge! Step 1. Go to the IGF schedule. Ideally, be logged in to IGF 2017 Sched so you can select what you want to see. But in reality, you’ll often find that when you enter a session you thought looked of relevance to you, it actually isn’t, so you have to go back to the full Sched outline anyway to find another session. Just before the circles containing all the pics of the people who are attending the session, you’ll find the details of the room that the session is being held in, sandwiched between a line of time details and line of content tags associated with the session. That’s the most important piece of information for remote participation. Remember the room number! You have three options. And you can do all three at once if you have the bandwidth and ability to follow multiple windows simultaneously! IGF 2017 Sched also has a page that links to all of these options, too. Open another tab in your browser and go to the online participation page. If you aren’t already signed into the IGF website, you will first be presented with a sign in page. Complete that hurdle. Find the room number that matches the room number of your session and click on that. Enter your name and email and submit that. Make sure your mic isn’t on unless you really want others in the WebEx room to hear what you’re saying/laughing hysterically at. Make sure your webcam isn’t on the whole time unless you really want other people in the webex room to see that you’re watching in your pajamas/have yet to shave or brush your hair/are breastfeeding your baby. There is a video displayed under the “participants” tab on the right side of the window, which is not of the same quality as that available from the streaming webcast. For the workshop rooms, it is not a shot of the front of the room with speakers and presentation screen. From the sessions I’ve watched so far, it’s generally a view of the audience, or a low angle, “up-nose” shot of panellists. Or sometimes the ceiling. If you have low bandwidth, close the “participants” tab so the video goes away. Don’t forget to turn you mic back on if you want to ask a question or give a statement to the room. Alternatively, you can use the chat facility, and the remote participation moderator in the room will read it out. Open another tab in your browser and go to the live captions page. You can only see the transcript from the point you have accessed the live transcript page. (The transcript module has the ability to have a button that allows you to see from the start of the session, but it’s not enabled at IGF). Webcast Streaming will take you to the “Assembly Hall (floor)” webcast, with live transcript underneath. If you want to view the webcast of a workshop or open forum, click on the “workshop rooms” link at the top of the page. When on the workshop rooms page, look to the “Workshop rooms” navigation list on the right hand side of the page, find the room number that matches the room number of your session and click on that. IGF’s live video homepage on YouTube. I’m just going to assume here that everyone is well versed in how YouTube works. Step 3. Switch between the various windows for an hour or so, then repeat the whole process when you need to swap to the next session. For many years, I have been a strong advocate for the Internet Governance Forum (IGF) and was even a member of the CSTD’s Working Group on IGF Improvements. I have been a consultant writer for the IGF Secretariat, and I cheered on the cause of the IGF’s continuation from the sidelines as an observer on the Australian government delegation during the UN General Assembly’s WSIS+10 negotiations in New York. Heck, I was even a booth babe back at WSIS Phase II in Tunis, on the Internet Pavilion, which aimed to “facilitate an understanding of why a collaborative and cooperative governance model is essential both to the success of the Internet and the development of the Information Society“. So why I am not attending the IGF for only the second time since it started? It’s tempting to say “I’m over it” and leave it at that. But that glib statement would be an over-simplification of why I’m not going to Geneva and not take into account the glimmer of hope I still hold out for the IGF as well as the fact that I’ve registered to participate online. Trying to fly home to the other side of the planet during the pre-Christmas travel rush is a horrible thought. 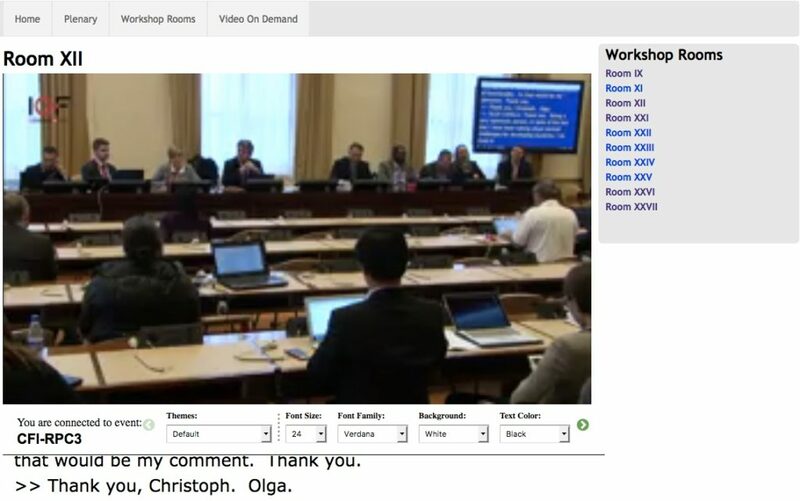 The fact that IGF couldn’t find a host for IGF 2017 until the last minute, and the fact that the last-minute volunteer, the Swiss government, wanted to make use of the free Palais des Nations facilities at the only time of year they’re available (because nobody is around in Geneva the week before Christmas), is yet another symptom of what happens when the IGF lacks the funding and commitment it needs to be truly successful. The ITU’s Internet-related Council Working Groups and the final meeting of the CSTD Working Group on Enhanced Cooperation in January have more of a potential impact on the future direction of Internet development and policy than the IGF does, so they take priority over the IGF talkfest for me. As much as I enjoy the chance to meet with the wide variety of stakeholders that attend the IGF (increasingly, many people I know are going to IGF, not for the actual sessions, but for the side meetings with representatives of organizations they normally wouldn’t be in the same location with), I cannot face traveling to Geneva from Australia twice within a month, so the January meetings win. “It” being Internet-related discussions and not the IGF specifically. It’s been a busy year and for the sake of my sanity, I just cannot handle another meeting regurgitating the same issues I’ve been following all year, with mostly the same group of people, just in different meeting rooms. I’m so over it all, my usual goodwill to provide the community with a constant stream of information as impartially as possible (I defend my right to inject the occasional exasperated comment about manels), even when nobody’s paying for my time, has been depleted completely. Nobody’s paying me for this IGF, so no tweeting from me this time. Instead, I point those of you who utilize my tweetstream to make their own jobs easier to the Geneva Internet Platform’s IGF 2017 reporting, which will consist of great daily reports from IGF as well as reports from individual IGF sessions. And of course, the IGF Chair’s Report at the end of the forum. And the IGF session transcripts, if you have lots of time on your hands. The number of forums hosting Internet policy discussions have grown like Topsy since governments at the World Summit on the Information Society (WSIS) in 2005 decided to mandate the creation of the Internet Governance Forum (IGF). One simply cannot attend them all. This is both good and bad. Clearly, Internet-related policy issues weren’t being discussed enough prior to 2005, or there wouldn’t have been the big hullabaloo that happened over the Internet during the WSIS process. The IGF was the compromise solution at WSIS between those wanting the UN (and more specifically, the ITU) to house all Internet policy discussions and decision-making (and management… let’s not forget there were concerted efforts for the ITU to take over the management and distribution of IP addresses and domain names) and those that felt that the Internet shouldn’t be handed over to UN agencies. NETmundial A one-off. There are regularly whispers of a 5 or 10 year anniversary event (possibly as part of the IGF) to review the progress of issues outlined in the NETmundial Multistakeholder Statement. NETmundial Initiative Inspired by NETmundial, the NETmundial Initiative’s funding dried up not too long after its initiator and main champion, ICANN CEO Fadi Chehadi, left ICANN. This is possibly the only initiative in the Internet governance space ever to have been allowed to die, with pretty much nobody mourning its loss. Global Conference on Cyber Space Originally organized as a one-off conference in 2011, it is now hosted every two years staged by a government with participation of non-government stakeholders. Global Forum on Cyber Expertise A capacity-building spin-off from the 2015 Global Conference on Cyber Space in The Hague, the GFCE was initiated by the Dutch government, and now has 60 members consisting of governments, IGOs and companies. NGOs can be invited to be “partners” of the GFCE if they have specific cyber expertise relevant to a GFCE initiative. The aim of the GFCE is to have “knowledge and best-practices together in one platform“. World Internet Conference The Chinese government’s answer to the IGF, and this year, described by someone at the conference as the Davos for the digital economy. Now in its fourth year, the WIC is continuing to adopt and adapt IGF-like activities (such as calling for best practices and launching publications during the event). WSIS Forum Paragraph 109 of the 2005 Tunis Agenda for the Information Society recommended that ITU, UNESCO and UNDP organize meetings of WSIS Action Line facilitators to discuss WSIS implementation. Probably impressed by the IGF’s early dynamism and participation from all stakeholder groups, in 2009, ITU (the most active of the UN agencies regarding WSIS) copied the IGF format and turned what had been a cluster of individual meetings related to specific Action Lines into the “WSIS Forum”. The WSIS Forum has increasingly included a lot of Internet-related sessions in its program. Given the WSIS Forum has a permanent home in Geneva, is hosted by a UN agency that has high visibility and strong support amongst developing country governments, and is increasingly covering some of the same Internet policy territory that is also part of the IGF agenda, the creation of the WSIS Forum has had the effect of diverting a significant portion of the IGF’s potential sources of government funding and support away from the IGF. WEF The World Economic Forum has been adding Internet governance topics to its lineup over the last few years. OECD The Organization for Economic Cooperation and Development has had a significant program on the Internet/Digital Economy since 2008, where it introduced civil society and Internet technical community advisory councils, on top of the existing business and industry and trade union advisory councils. UNESCO The United Nations Educational, Scientific and Cultural Organization has increasingly engaged in activities such as Internet freedom, Internet universality, and Internet governance. The WGs have consisted of representatives from different stakeholder groups, and over time, the WGs became increasingly open in their proceedings. Global Commission on Internet Governance Created in 2014 as a time-limited commission, the same year as NETmundial was held, by two think tanks, the Commission developed recommendations for maintaining One Internet. Global Commission on the Stability of Cyberspace A 3-year project launched in February this year, the GCSC will “formulate policy recommendations for action-applicable to both government and the private sector led initiatives” related to “the security and stability in and of cyberspace”. The GCSC is committed to working with the “full range of stakeholders to develop shared understandings”. GIPO A project of the European Commission, the Global Internet Policy Observatory was launched in 2015 to be a repository of information to help support Internet policy-making. 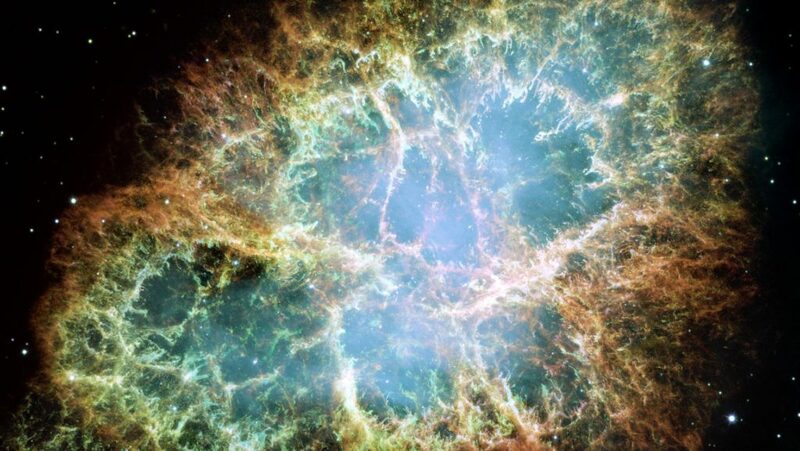 Its funding runs out very shortly, and the European Commission has long been looking for someone to take on the running of the Observatory Tool – so far, without success. ITU Council Working Group on International Internet-related Public Policy Issues (CWG-Internet) Originally the Dedicated Group on International Internet-related Public Policy Issues, this first met in 2009 (same year as the first WSIS Forum) and was open to Member States only. Since 2015, however, there has been an additional “open consultation” process, where all stakeholders are invited to submit contributions on topics that ITU’s Member States have decided on. There is also a physical open consultation meeting prior to the CWG-Internet meeting that ITU sector members and other stakeholders can participate in. Internet and Jurisdiction Project The Internet and Jurisdiction Project began holding conferences in 2016 and will now hold an intersessional program of multistakeholder working groups that will culminate in the presentation of “policy standards and operational solutions” at the 2019 conference in Germany. I completely understand the desire of some governments and stakeholders to have a “one-stop Internet shop” housed in an existing UN body (ITU?) or a new one (basically, to cover all issues, it would need to be a “UN General Assembly for the Internet”), but the reality is that, as my favourite standards cartoon notes, wanting to come up with a new, universal standard to replace all previous competing standards just results in adding another competing standard to the mix. A one-stop Internet shop just isn’t going to be able to cover all Internet issues and people would just have to add yet another forum to their already overloaded annual schedule of Internet-related activities. When there are so many Internet governance-related activities on the calendar these days, it’s becoming more important to triage events. For me, and for many others I have talked with, IGF, with its lack of concrete outcomes and its increasing imbalance of stakeholders, is gradually losing out to events and processes that can produce Internet-altering outcomes for the world. IGF may be a fun place to catch up with industry friends and colleagues, but, sadly, for those of us with limited resources, events that can produce (usually multilateral) agreements, recommendations or resolutions have to take priority.